You can customize a listing template to fit your specific needs. This tutorial will show you how to customize a listing template. 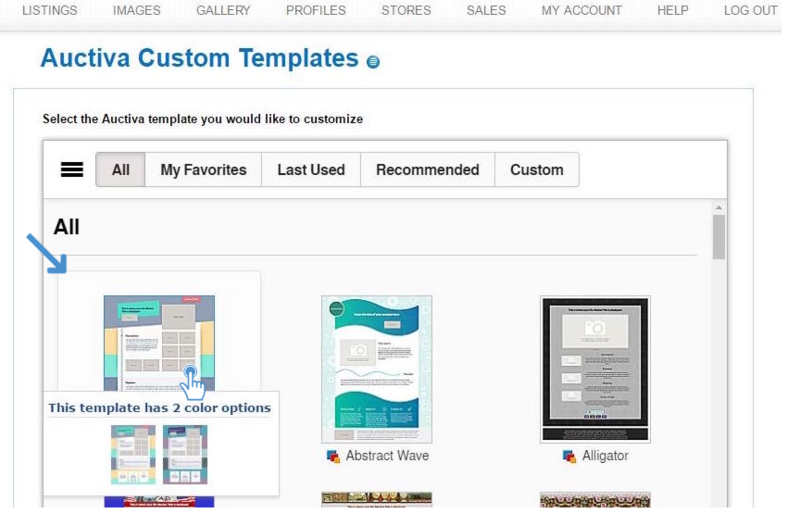 Listing templates can be edited to add your customizations to a listing. You can edit a listing in HTML or Standard mode. Step 1. Load a listing template. Hover your mouse over the Listings tab and click on the "Customize" link (Figure 1). Step 2. Edit listing template. Select a listing template to customize from the list (Figure 2). Step 3. Choose the Template Skin. Use the "Skin" drop down menu to choose the color of your template and then click "Select" (Figure 3). Figure 3. Select the "Skin" of the template, then click "Select". Template Name: Enter a new name for the template. This is required. Thumbnail URL: If you would like to choose a different thumbnail image for the template, click on the Browse button. Choosing a unique thumbnail image may make it easier to find this template when you are browsing for it. Switch to: You can switch editing modes, if necessary. The default mode is HTML. In this mode, you can edit the HTML code directly. Switch to Standard mode, by clicking on the "Source" button (Figure 4A). 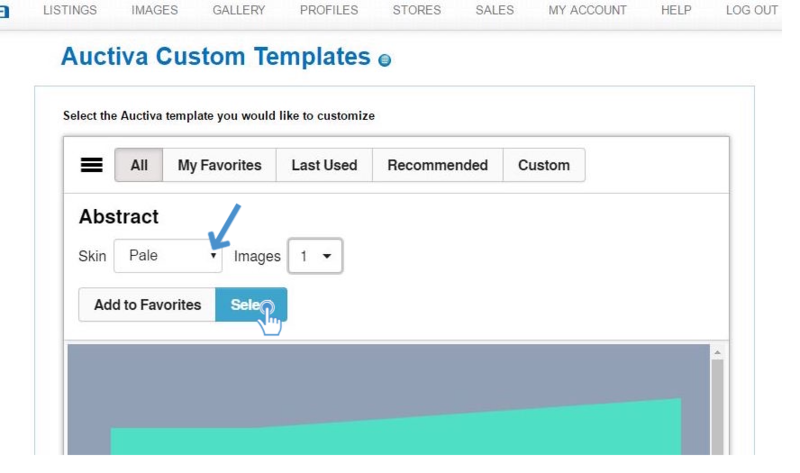 Use the Custom Template Tags section to insert different listing elements into the template. To add a custom template tag, place your cursor in the Template Editor (Figure 4B) and click on the tag. The tag will be added at the insertion point. Figure 4. Edit mode options (A). Insertion point in Template Editor (B). Make the necessary edits to the template. Click on the Save and Preview button to save the custom template and launch the Preview window. To exit the Preview window, click on the Close Window button. When finished, click on the "Save As New" button and the custom template will be added and ready to use in new listings. All custom listings will be accessible in the "Custom" option of the "Select Template" box when selecting a template from the Auctiva Lister (Figure 5.). Figure 5. 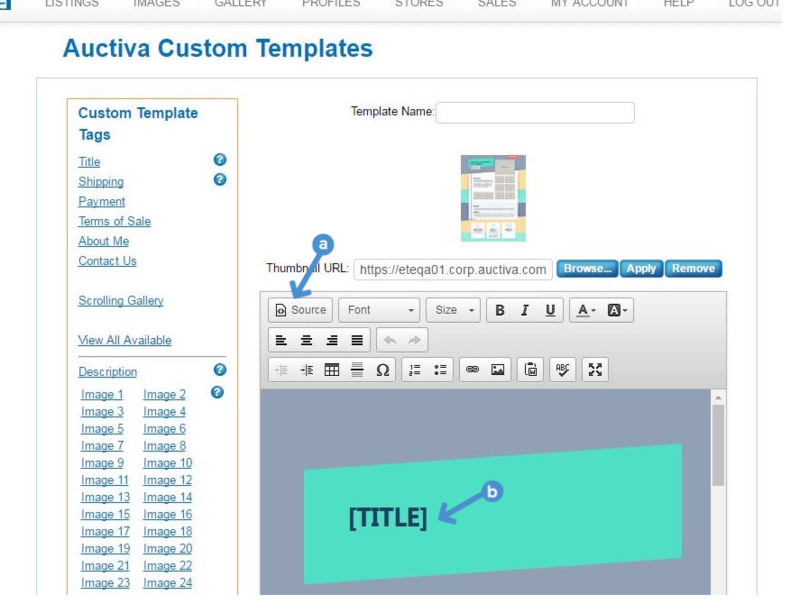 Select the "Custom" option when choosing a custom template from the Auctiva Lister. This completes the task of customizing a listing template.